Why do grub.cfg and actual boot options differ? After a recent upgrade my boot options were changed. Following instructions I found, I downloaded a tool called grub-cfg and used it to change my boot options. Unfortunately, it didn't work. menuentry "Memory test (memtest86+, serial console 115200)"
If I understand things right, the entries from the grep are exactly what I should be seeing on the boot screen, but they obviously aren't. 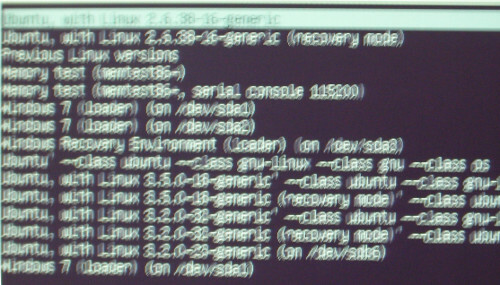 I want the grub boot options to be what I set them to with grub config; the default should take me to the 12.10 kernel instead of the 12.04 (2.6.38-16 generic) kernel. What's going on? What's particularly interesting here is that on my system I have windows 7, Ubuntu 12.04 and Ubuntu 12.10. The grub.d/41_custom file lives on the 12.04 system not the 12.10. So what happened is that after the last upgrade grub is reading 12.10 /boot/grub.cfg but parsing the /etc/grub.d from the 12.04 area. Does anyone have suggestions where to look next? After considering the discovery that reboot used a different partion for the /etc/grub.d files than the current OS version, I decided it must be using grub from the older install. I looked at the grub configuration graphical tool and discovered an option to re-install the MBR and did this. Problem solved -- I now boot from the proper grub.cfg file. Thanks for the assistance. The suggestion about grub.d by WindowsEscapest is what put me on the right track.